The Namib Desert is the oldest desert in the world and the millions of years gone by have created a fascinating and brilliantly unique landscape. The salt pan of Sossusvlei was created when the the 150 kilometer Tsauchab river silted over time. It is believed that the Tsauchab once flowed from the Naukluft mountains to around 50 km off the Atlantic Ocean. Eventually, the giant dunes blocked the flow of the river and ended Tsauchab river. It formed a cracked and dry surface of salt and clay. Sossusvlei originates from the Nam word “sossos” meaning dead-end and the Afrikaans word “vlei” meaning marsh. Remarkably, only once every ten years the dry cracked earth transforms into a luscious flowing river which attracts countless animals. As soon as the spectacle is over, the bottom of the Sossusvlei is left behind as cracking clay soil that looks like broken dry clay. When heavy rainfalls brings the Tsauchab to a lush flowing river, the salt pan in the middle of the desert fills with the refreshing cool water. The water is flushed from the nearby Naukluft mountains through the Sesriem Canyon up into the vlei. The hard and cracked clay soil prevents the water from seeping into the soil so it quickly forms a lake that continues for a while. It become so wide that it will take you half an hour to swim across! The beautiful fresh blue-green water attracts countless waterfowl. In this very barren region the water comes as a blessing to the desert animals like springbok and oryx antelopes who migrate to the water edge. See The Living Desert! After four weeks it’s all over and returns to an arid dry riverbed for another ten years or so. Contrary to this in 1997 there was a huge flood that caused the Sossusvlei to be water logged for an entire year. In the following years, 2000 and 2006 there were further floodings. It rained so much that a lodge and campsite in Sesriem was flooded. 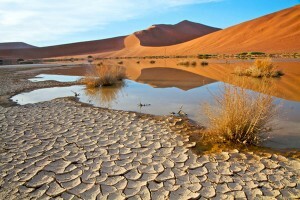 In February 2011, the Sossusvlei was completely cut off from the outside world. The Tsauchab was so flooded that it was impossible to access the area via roads. Besides the Atacama desert in South America, the Namib is the world’s only coastal desert. 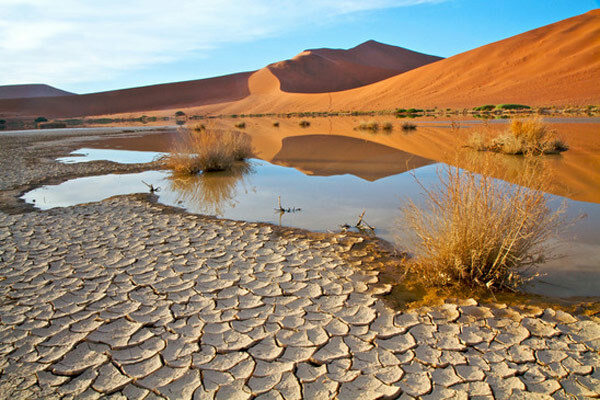 With approximately 20 mm of rainfall per year, it is the driest desert in the world. The Namib emerged approximately 80 million years ago and Geologists believe that the Namib is one of the oldest parts of the earth’s crust. The origins of the coastal desert go back to the supercontinent of Gondwana, which once covered the entire southern hemisphere, before it began to drift apart due to continental drift. The Namib Desert stretches over 2,000 kilometers all the way from Angola into southern Namibia. 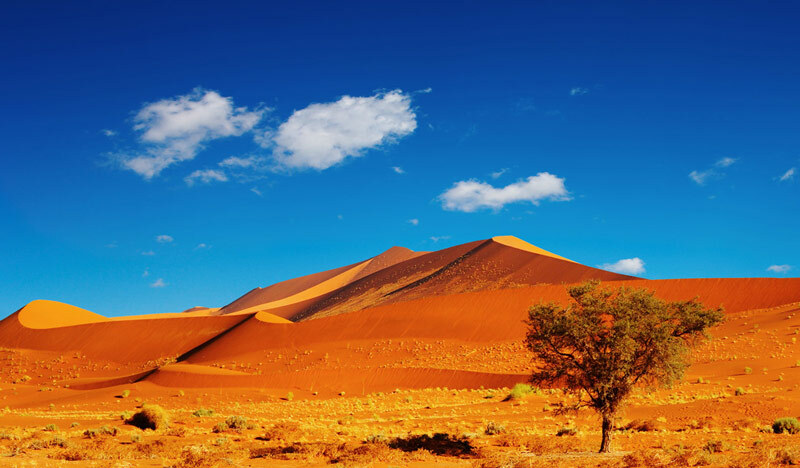 Overall, the Namib covers approximately 95,000 square kilometers. The shift of Antarctica from south to north caused the cold flow of the Benguela current to flow towards the southern coast of Africa. The cold sea water prevents evaporation which means clouds cannot be formed creating a dry almost entirely rainless desert. The only precipitation the Namib desert receives is the fog that occurs, giving it the name “fog dessert”.